You're a coach and you want to learn how to do social media marketing that will generate business results for you. You also don't want to waste more than a few minutes a day on social media. Perhaps you're posting many times a day on Facebook, Instagram and Twitter and aren't seeing any new clients. 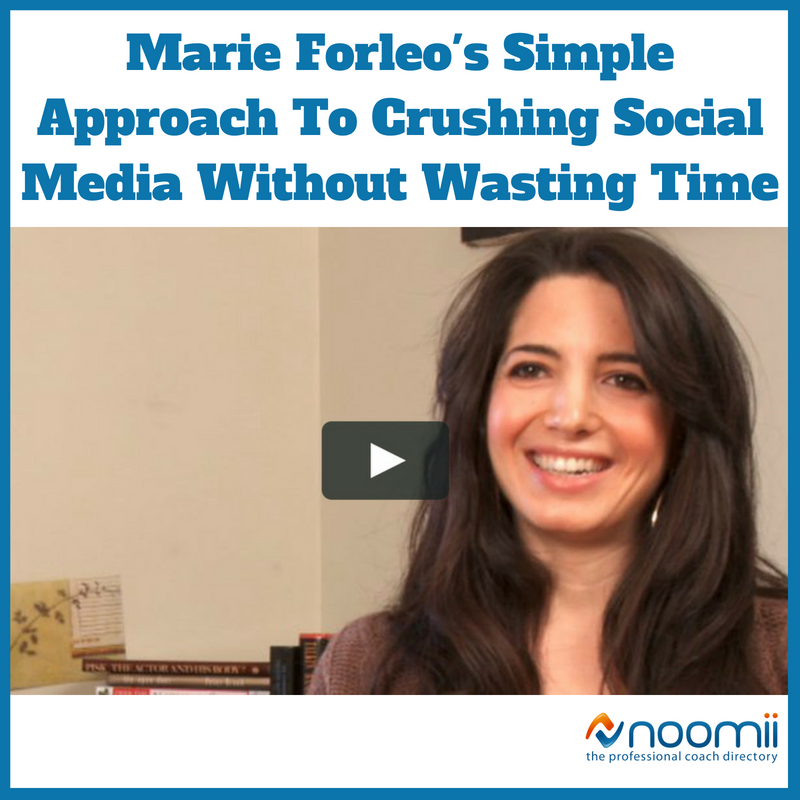 Today, we're going to attempt to solve the problem of ineffective social media marketing by learning from a coach with an outstanding social media presence: Marie Forleo. If you don't know her, Marie is a life and business coach, host of Marie TV, an author and more. I'm personally subscribed to her email list and have taken a business course of hers. I like her style — she's genuine, quirky and treats you like a close friend even though she has over 500k Facebook followers. Marie focuses most of her attention on creating YouTube video content and then crossposts these videos to all of her other channels. Marie also focuses on her email list, which is where she sells everything and shares new content. She sends an email to her list of the latest Marie TV YouTube video every Tuesday at 9am (the fact that I knew that without looking it up proves she's doing a great job with it). You don't need to be on every channel. Choosing just one channel to focus on, aside from email and then automatically cross-posting to the rest of your channels is the best way to go if you're limited on time. At the core, Marie is just doing a weekly YouYube video that she cross-posts to all of her other channels. If you're limited on time and resources, you don't need to make your social media strategy more complicated than that. Because Marie's now in the position where she can have a person or team helping her manage her accounts, her channels include a little more than just YouTube videos. But you don't need to complicate your channels unless you can afford to. Keep them simple and manageable. She posts her YouTube videos, inspirational image quotes, engaging questions for her followers, videos and articles from other people, and the occasional sales offer. Mostly weekly interviews with successful, interesting and notable people such as Tim Ferris, Gabby Bernstein and Daymond John. She also posts inspirational videos of her talking such as "Making Friends As an Adult Is So Much Easier If You Do This" and "How to Motivate Yourself to Start Right Now." She occasionally posts quirky videos where she shows you what her life and personality is like "Unplugged." Selfies, normal pictures of herself and life, inspirational image quotes, preview clips of her YouTube videos. Inspirational image quotes, her YouTube videos, tips, inspirational quotes from famous people such as Walt Disney and Michelle Obama, Retweets of her stance on current events (such as gun control). She has about 20 different boards on topics such as Free Business Tools, Overcome Your Fears, Creative Inspiration, Interviews that Inspire. In the boards are all inspirational image quotes. Her company page shares Marie's Youtube videos. For Marie, Youtube is the heart, and every other channel is an amplification of that. But she makes sure to connect her email opt-in offer to her Youtube videos and her other content, because email is what generates the sales and business (social media by itself usually doesn't generate much business unless connected to an email marketing funnel). How often does Marie post on each channel? How many times should you post on each channel? What's the right number of times to post per day or week? The number of times you should post varies and there isn't an exact formula. But we'll look to Marie for guidance on the general ballpark range. Facebook — 1-4 times a day on weekdays. 1 a day on weekends. Occasionally she skips days and it's no big deal. Youtube — Exactly once a week. Twitter — Usually 5-10 times a day with the occasional day skipped. Instagram — About 4-5 times a week. Pinterest — Occasionally updates her Pinterest board. LinkedIn — Her company page posts a few updates a week. She also occasionally pays for Facebook and Instagram advertisements for her courses and posts. I don't have the data of how much she's spending and who she's targeting, but it's good to take note that she's doing it. Marie has said plenty about social media herself. In the video above, she answers questions about successfully using social media for business without feeling like you're on social media all day. In the video, Marie says she mainly focuses on updating her blog once a week with her latest video. And she doesn't spend more than 15 minutes a day tops on social media. You don't have to do it. You can be successful and not be on social media. Less is more. If you want to be active, on social media, pick one or two places and ignore the rest. Choose ones you like and commit to those platforms. Either do something full out or don't do it at all. Create a social media schedule to keep you organized. 1. Not including email (which every coach should have), choose one channel to focus on that would work best for you and your business. You can still use other channels, but think of them more as supplements to your core channel. 2. Figure out how much content you can produce a week, what kind of content you want to produce, and how you're going to share it. If you write/create content everyday, you should be able to publish at least one high quality piece of content per week. If your preferred medium is video and you produce one great video a week, you could simply share the video on Youtube, Facebook, your blog, and your email list spending no more than an hour or two a week on social media. If you prefer writing to speaking and you produce one great article a week, you could share the article on your blog, email list, Facebook and the best snippets from the article on Twitter. 3. Do your best to carve our a daily habit of writing/creating content for an hour or two a day (or whatever you can manage). 4. Make a schedule in your calendar of your writing/creating and publishing plan. 5. Once you're getting some results from social media and want to amplify your presence to more channels, you could hire experts to help you manage your channels. But you don't need to do this until you're really successful on one channel.